It is undeniable that technology has change and changed life substantially over the years. Each and every aspect of life has been shifted and shaped in some way by the growth of technology. Some changes are more evident and noticeable than others. However, some are still new to the market and remain somewhat of a rarity. Whether or not you know it, art as you know it is on the verge of a major revolution. With the invention of the 3D pen, art will take on a new life and artists around the world will be able to create unique masterpieces like never before. If you’re unfamiliar with this technology, you’re not alone. 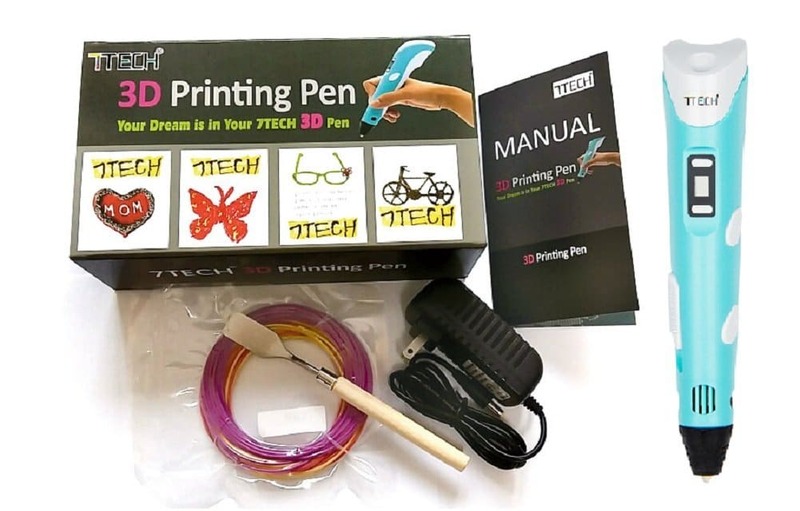 The 3D printer pen is widely known, yet the 3D pen is somewhat obscure. What is it? How does it work? Why would you want to buy one? Within this comprehensive guide, you will be able to find out! You will also find a comprehensive buying guide and a breakdown of the market’s best 3D pens. 3D printing is becoming extremely popular, because it offers a revolutionized crafting experienced. Of course, this would not be possible without a 3D printer and 3D printing pen. 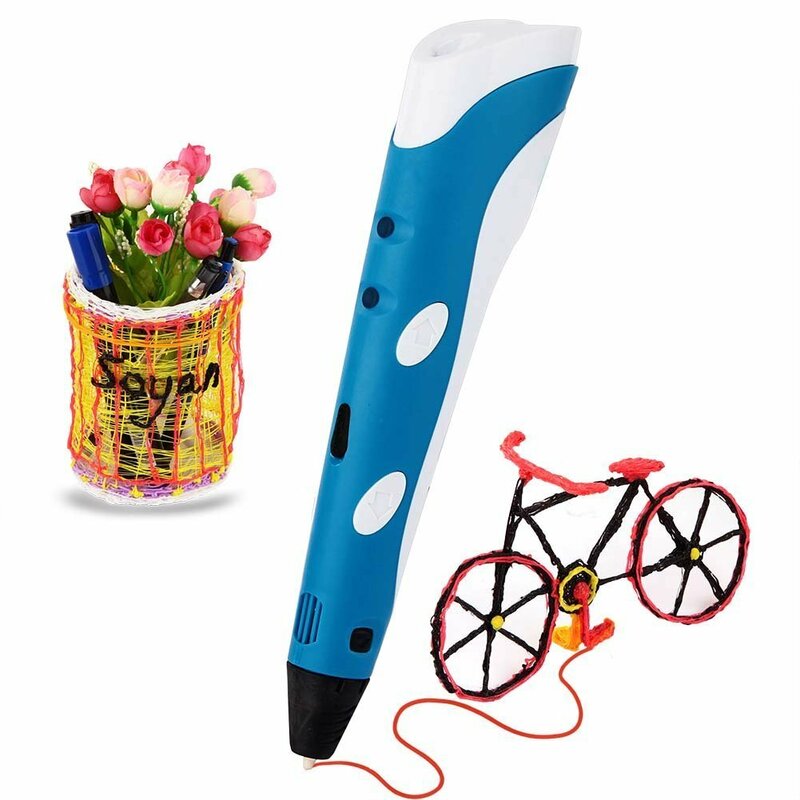 The 3Doodler 2.0 MoMA Printing Pen is top-of-the-line and this is mainly contributed to the embedded technology. It is extremely user friendly, making it suitable for grade school children and adults. When you first look at the pen, you will notice its durable design and unique nozzle. The nozzle is designed to deliver maximum performance, with a steady steam of warm flexible plastic. The plastic will remain suspended in space until it cools down to room temperature. The dual-speed control feature allows users to make speed adjustments during use. The premium drive system has also been re-engineered to promote a smoother operation and eliminates clogging. It is important to note that it will take some practice, before you are able to achieve perfection, but you will have a lot of fun in the meantime. The LED light will turn from blue to green, when the ABS filament is ready for use. This will definitely take the guesswork out of the process, since the filament must be melted to a thin consistency, so it will feed through the nozzle. The great benefit of the 3Doodler 2.0 is the temperature adjustment mechanism. While, some users will prefer to work with the maximum temperature, others will prefer the lower temperature level. Just remember, the higher the temperature, the thinner the filament consistency. Beginners should start out on the maximum temperature level and gradually work their way to the lower level. This is mainly because the filament is easier to manipulate when it is extremely thin, but it does take a bit longer to cool down. One of the primary customer complaints is the extended heat-up time. The first strand will take about 35-45 seconds to heat up and 30 seconds or less thereafter. While, this is normally not an issue for most people, it can be intrusive in the very beginning. If the pen stops feeding during use, just wait a couple of seconds, before backing the strand out, clip off the melted tip, and then restart. You may find it works better to wait until the pen has time to heat up to the maximum temperature level, before inserting the plastic into it. 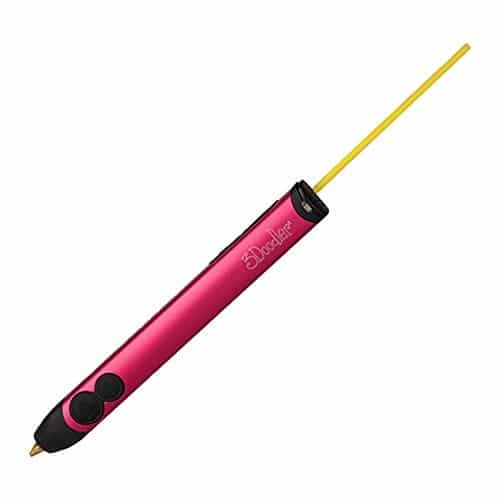 Overall, the 3Doodler 2.0 is a quality 3D printing pen. It does take some practice to achieve a flawless creation. Remain patient and let the pen heat up to the maximum temperature level, before each use and between refills. The maximum temperature level works better for beginners. The electric cable is a little short, so you will need to situate yourself near an electrical outlet. The temperature can also be adjusted very easily, by rotating the screw on the tip of the pen. 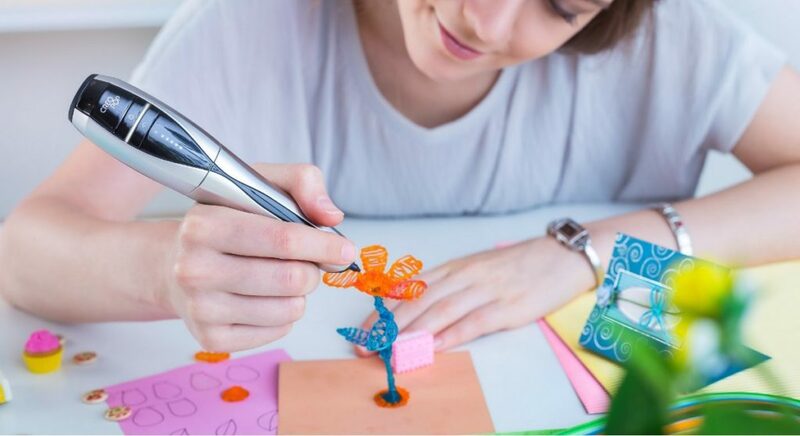 If you are looking for a 3D printing pen that will offer lots of flexibility, durability, and versatility, you should definitely consider the CreoPop. This model is designed with the artist or crafts-person in mind. Because it is embedded with premium technology and features that will enhance your creativity and crafting skills. The cordless design will more preferable to the corded design, since it will offer more flexibility. Many of the competitor models are equipped with an extremely short electric cable, making it very difficult to maneuver during operation. The CreoPop printing pen operates on battery power. It is equipped with a lithium ion battery and comes with a charging cable. When the battery dies, you can simply plug in the electric cable and continue to work on your project. The battery will last a bit longer, when utilizing the lowest speed setting, which is suitable for most projects. There are 5 speed settings to select from, but beginners should always start out on the lowest level and gradually work their way up to the maximum level. The bright LED will light up the area of the paper you are working on, so it can be utilized in dark environments. The most unique benefit of the CreoPop is it utilizes photopolymer ink. The ink cartridges are available in various colors, including purple, green, blue, black, yellow, red, and white. The ink does not contain any harmful toxins, which is unlike some of the filament utilized with other brands. The ink cartridge is slightly more expensive than filament, but when you consider its non-toxic rating, the price variance will not be of concern. 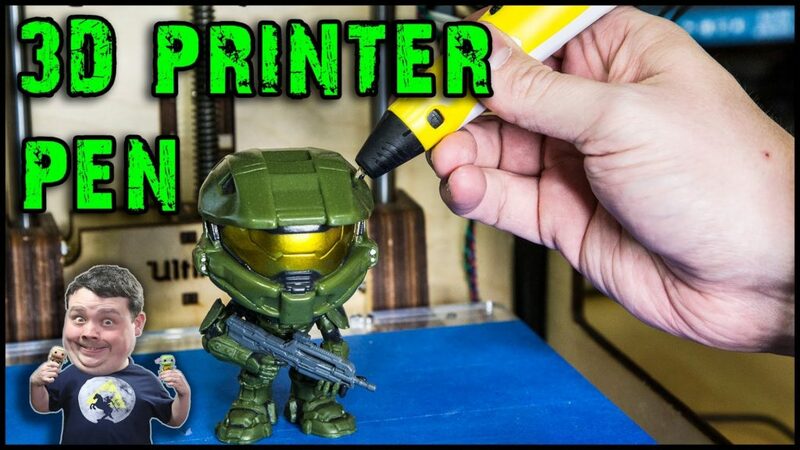 The CreoPop is one of the best 3D printing pens on the market. Its cordless design offers more flexibility than the corded model. It functionality is very user friendly, but it will take a bit of practice to achieve perfection. When working on a project, be sure to place it on a thick piece of cardboard, because the ink will damage some types of furniture. Despite being fairly new, the 3D pen market is still over saturated. This can make it very difficult to find a good pen and will require you to weed through and eliminate the duds. Before going any further, you may want to take the time to check out the MYNT3D Professional 3D Pen. This pen will provide you with everything needed to create stunning works of art, without deflating your wallet or emptying your bank account. The pen is very customizable, so you can control all aspects of its operation. In order to ensure you’re able to create the beautiful works of art that you desire, you’ll need to be able to adjust the speed and temperature of the pen. This is a possibility with the MYNT3D. The pen is equipped with an adjustable feed, which gives you full control over the speed and flow of the filament. If you want to cover large surfaces quickly, you’ll be able to do so, by increasing the speed. At the same time, the pen’s temperature is controllable. The temperature can be adjusted in increments of 1 degree. 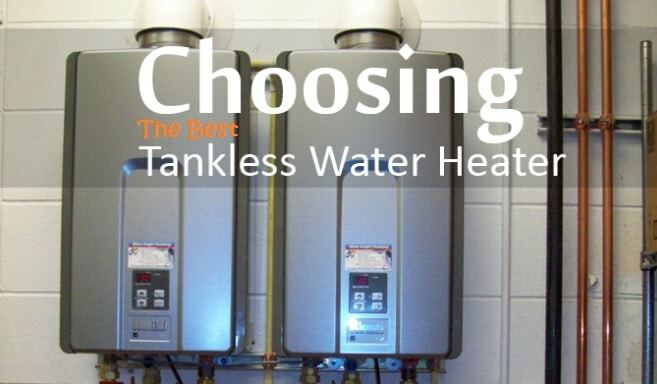 The available temperature range extends from 130 to 240-degrees Celsius. And finally, you can also double click the bottom button to make the pen continuously eject the plastic. Despite the moderate affordability of the MYNT3D, the package includes a variety of helpful accessories. First and foremost, the package includes the A/C adapter, which is needed to power the pen. You’ll also receive 3 colors of plastic filament. The included filament is made from ABS plastic. 3 colors are more than enough to get you started, but you may want to consider purchasing more in the near future. All in all, the MYNT3D will prove to be a great investment for anyone, who wishes to create 3D works of art. You will need to invest in some additional filament, but the pen comes with everything you need to begin utilizing it right away. It is sleek, affordable, and a great overall value! 3D printing pens are the future of the art world and you need to jump on the bandwagon. With the Soyan 3D Printing Pen, you can actually bring your imagination to life with real life 3D sculptures. This pen uses a heated plastic that instantly hardens when it leaves it tip of the pen allowing you to create real life 3D creations. This pen was designed to be lightweight, slim, and easier to handle. You can use the Soyan pen for long periods of time without tiring out your hand. Thanks to the lightweight design, you can operate the pen easier and have much more control over extrusion speed. The Soyan pen gives you the option of drawing vertically or horizontally. This pen is safe and suitable for men, women, and children. This pen is not only great for creating 3D sculptors, but it can help kids that have trouble grasping abstract concepts. These kids can actually touch and feel what they are creating, which creates a visual aid. Along with this the pen can also help kids improve their spatial thinking abilities. The Soyan kid will encourage kids to be more creative. When you purchase the Soyan 3D printing pen you will receive everything that you need to get started including the pen, quick start quick, power adapter, and 30g of ABS filament. The great benefits of owning the Soyan 3D printing pen is its compatibility and versatility. It is suitable for all age groups, but younger children should be monitored at all times. Soyan is so versatile that it can be utilized for drawing on paper, 3D printing, and freehand. Its functionality of so easily that the user can make quick color changes in the middle of their project. To enhance the electric cable’s length, you may want to add an extensive cord or powerstrip, this will also offer more flexibility. 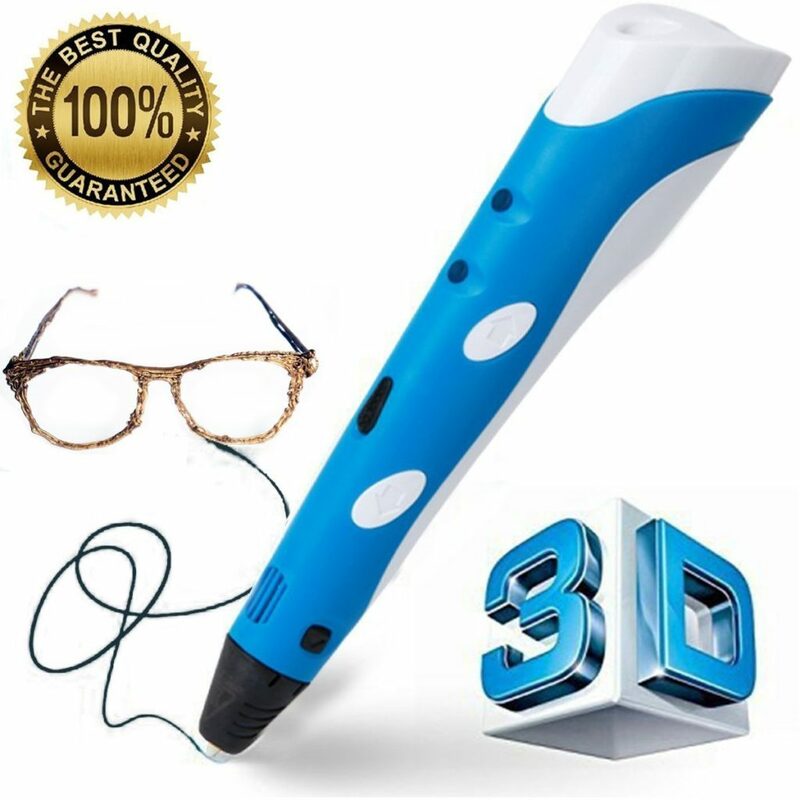 If you are looking a state-of-the-art 3D pen, you cannot go wrong with the Soyan 3D. This pen really has it all, plus so much more. At this affordable price the pen will make a great addition to any home. Everything you need to get started creating 3D sculptors is included with the purchase of this product. While some consumers will want to create professional works of art, others will only be interested in doodling in their spare time. It is essential to make sure you opt for a pen, which accommodate your precise desires. If you fall into the latter category, you owe it to yourself to check out the Excelvan DIY 3D Pen. The pen is very affordable, yet incredibly versatile. This makes it suitable for everyone, but more geared towards hobbyists. Below, you’ll learn more about this pen and its features. When it comes down to it, everyone will want something different. With the Excelvan, it is impossible to lose. The pen is available in four unique colors, including black, blue, green, and white. This gives you the ability to select a model, which will accommodate your gender and your preferences. And, the pen’s operation can be adjusted immensely. There are buttons on the front that give you complete control over the pen’s speed and temperature. When using ABS filament, you’ll be able to adjust the heat between 180 and 210-degrees. When using PLA, you can choose temperatures between 160 and 180-degrees. And, when it comes to extrusion speeds, there are 8 digital adjustable grades to choose from. When purchasing the Excelvan, you will definitely receive more than you pay for. First and foremost, you’ll receive the pen and the power adapter. These are necessities. You’ll also receive a pen base. When the pen is not in use, the base will keep the pen safe and will protect the tip. Also, the package will include a single 3-meter roll of PLA filament and a 3-meter roll of ABS filament. You’ll need to invest in additional colors, but these two colors, which are selected randomly, will get you started. And finally, the package will include the user manual. If you have any problems using the pen, you can always refer to the manual and find the answer you need. The Excelvan is designed to protect you and your family from harm. First and foremost, the pen is created with a lower temperature safe nozzle. Although the pen will get hot enough to sufficiently heat the filament, it will not burn your skin. And, the pen features a 1-minute automatic shutoff. If the pen remains inactive for a single minute, it will enter sleep mode to prevent fire hazards. 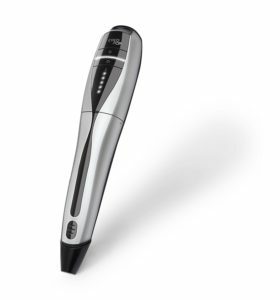 At the end of the day, there is a lot to like about the Excelvan 3D Pen. It is incredibly affordable, ergonomically designed, and will most certainly give you the ability to create wonderful masterpieces. 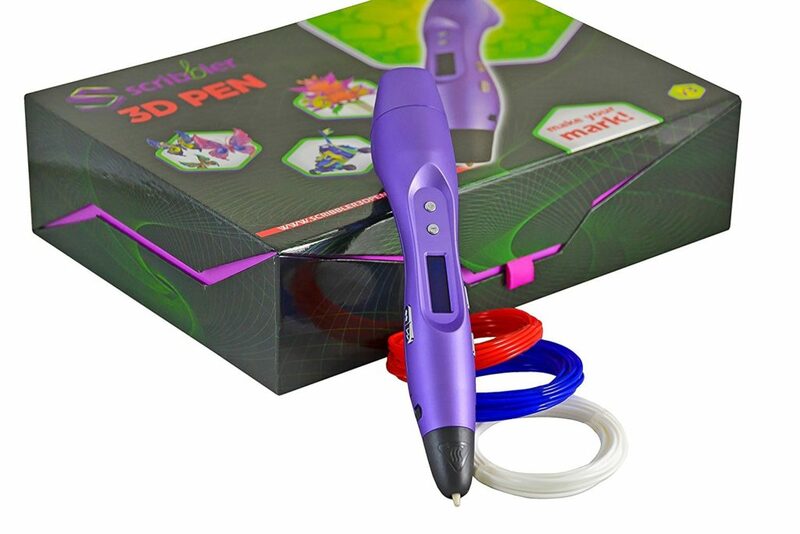 If you’re purchasing a 3D pen for a child, you will definitely want to consider the Excelvan! Its safety features make it much more suitable for younger children and helps to diminish the probability of injuries and burns. Everyone can enhance his or her artistic skills with a DEWANG 3D Printing Pen. This device is designed with the artist in mind, because it consists of everything you need to perfect your project. Its ergonomic design is very desirable and competitor brands fail in comparison. This design always makes it easier to control and maneuver, even with the tiniest hands. If you are ready to toss those markers and clay in the trash, you may be ready to take on the DEWANG. The DEWANG is a battery-operated device to offer more flexibility and maneuverability. An electrical charging cable is included in the package, so you can make quick recharges, even when you are on the go. The pen will continue to operate when the electric cable is connected to prevent any intrusions. The filament insert port is conveniently located on the top portion of the pen. You simply need to insert the tip of the filament into the port, wait for the pen to reach the maximum temperature setting, and begin bringing your creation to life. 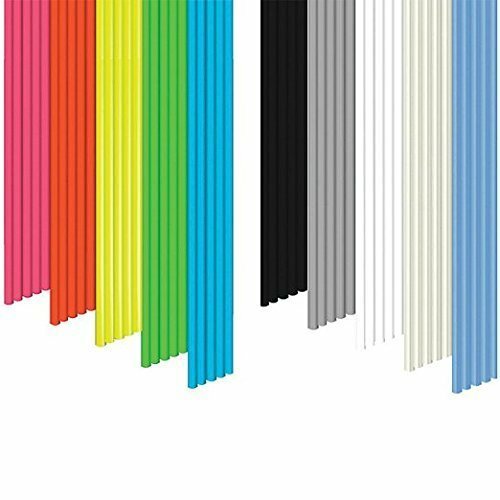 The PLA filament is very affordable and available in various colors. The heating mechanism embedded into the pen will heat up the filament to a thin consistency. The maximum temperature setting is more desirable, because it makes the filament easier to handle. The spinning speed is adjustable, so you can easily preset and calibrate the speed during operation. The DEWANG is a very affordable 3D printing pen that is designed with the hobbyist and artist in mind. While, its design is simplistic, it is capable of offering the necessities of 3D printing. Suitable for children 6 years and older, but constant supervision is a necessity. Cool-to-touch exterior eliminates the risk of skin burns and discomfort. 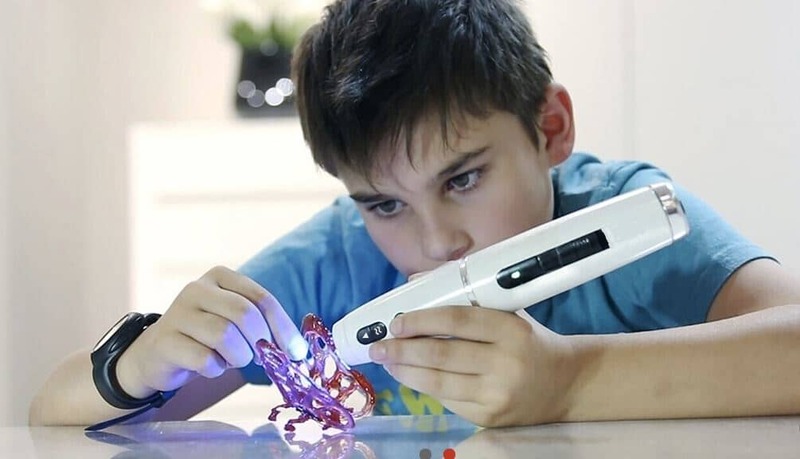 Those looking for an excellent 3D pen, which won’t break the bank, should look no further than the Manve Intelligent 3D Printing Pen. The pen might be affordable, but it truly delivers a great performance and a big bang for its buck. The pen comes with everything that is needed to create 3D works within a matter of minutes. It is lightweight, ergonomically designed, and will rest comfortably in your hand throughout the duration. Is this the best pen for your money? Continue reading below to find out. First and foremost, you should take the opportunity to examine the package’s contents. What will you receive for your money? Well, you’ll receive the 3D printing pen, as well as the necessary power adapter. Take note that the power adapter is only designed for use within the United States. A handy operation instruction booklet is also included. The booklet will provide you with a comprehensive rundown for using the device safely. 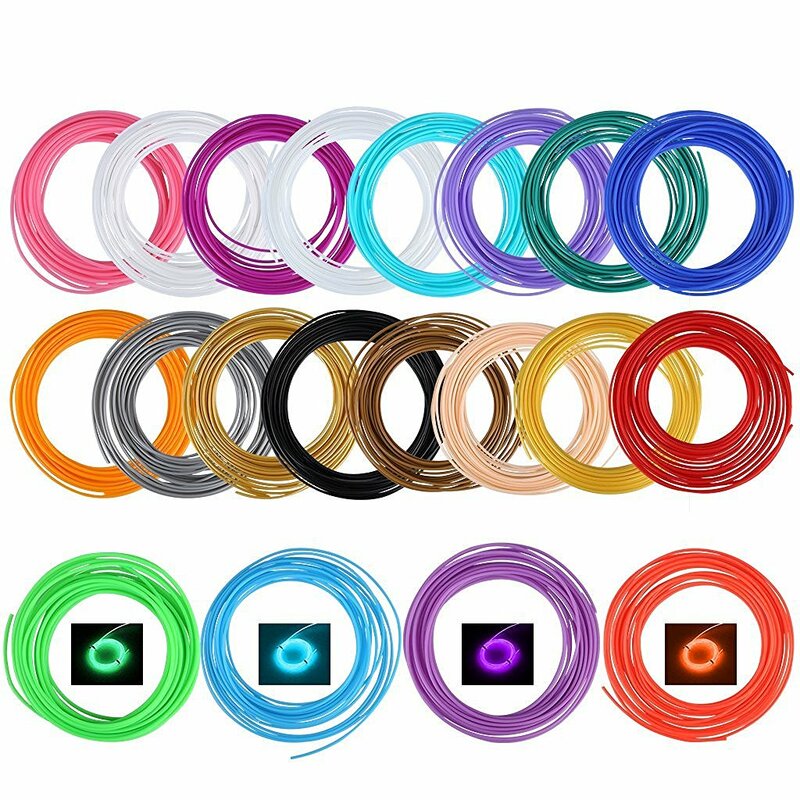 Also, the package includes 3 1.75mm ABS filaments with various colors. The Manve Intelligent 3D Pen is very versatile and can be utilized with ABS and PLA filaments. The manufacturers of the pen recommend using PLA, as it is biodegradable. The pen also comes with a safety shutoff mechanism. When the pen remains idle for 5 minutes, it will actually switch to standby mode. This turns the heating ring off, so you don’t have to worry about burns. The pen also features regulation options for its speed and temperature. The speed control mechanism is conveniently located near the top of the pen. This ensures it remains easily accessible, even when you’re in the middle of creating a beautiful masterpiece. 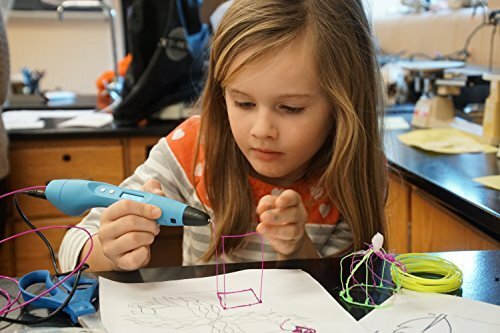 The Manve 3D Pen is designed in a way that makes it easy to use. Even if you’ve never used a 3D pen, you’ll be able to figure out pretty easily. If you run into any problems along the way, you’ll be able to flip through the included instruction booklet to find the answer you need. There are two LED lights, which let you know when the pen has power and when it is working. The pen also features a wire feeding button and a wire unloading button. They’re clearly labeled, so you won’t have any difficulty loading the filament, when necessary. The wire loading slot is found on the back of the pen. Simply slide the wide inside and push the associated button. Within seconds, you’ll be ready to go! All in all, the Manve Intelligent 3D Pen is a good investment for most. 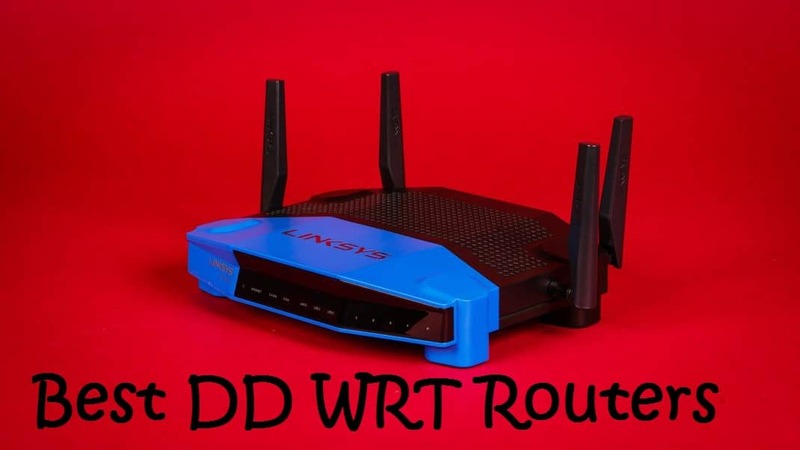 It is easy to use, very versatile, and incredibly affordable. The pen is suitable for all, but it is best for beginners, since it is easy to hold and very simple to operate. For the price, you really cannot go wrong with the Manve 3D Pen. As you know 3D printing has built a significant buzz lately. One company has already release a printer that is fairly affordable to most, but the program requires a quite a bit of computer expertise, not to mention the fact that you must own a computer. However, you do have an alternate choice with the 7TECH 3D Printing Pen. This pen takes strips of plastic and extrudes them to the tip to make your creations come to live. You can literally draw in thin air and make your drawings stand up. One of the most unique things about the 7TECH Printing Pen is it comes equipped with a convenient easy to read LCD screen. In order for the pen to begin melting the plastic filament it must reach a certain temperature, and the LCD screen will actually display then temperature as it rises. This aspect of the pen helps to keep the user in control and aware at all times. 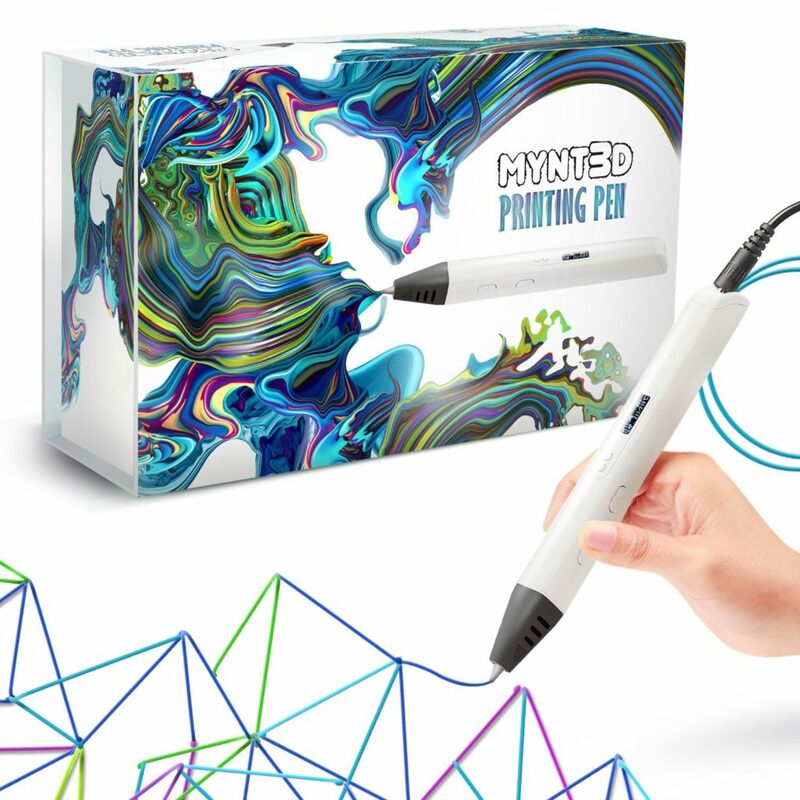 When you purchase this 3D pen, you can get started right away creating 3D art, because the package includes everything that you need, including a helpful instructional guide that show you how to use and operate the pen. Backed by a 1-year guarantee you can rest assured that you are purchasing a great quality product. For the price and thanks to enormous benefits of the pen, it is undeniably an excellent value. Art has been around for a long time, but over the years it has greatly improved due to technological advances. The Scribbler 3D Pen is tool of this generation for creating amazing 3D works of art. You can build just about anything and everything that you could imagine from the ground up. With this pen you can literally make your art come to life. 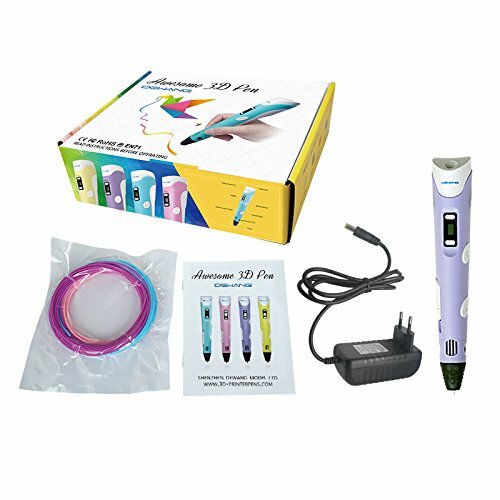 This unique pen comes along with many features and will allow you to take your creations to the next level. One thing that sets this 3D pen apart from the others is the lightweight design and the construction of the pen. The pen is so light in weight that you can use it for hours at a time without tiring out your hand. The lightweight design also makes it much easier to bring to the heated filament off the page. However, you should not let the lightweight design fool you, because the tool is constructed with durable materials that are built to last. At the end of the day, you are not going to be disappointed with this amazing 3D pen. With six different speed settings to choose from, you will not have a problem finding the speeds that suits your style. Everything you need to get started in included with purchase, so upon receiving the product you can go right to work. The pen is definitely one of the best on the market. It is versatile, user friendly, and will certainly help you make some awesome creations. The CCBETTER Intelligent is a high-quality 3D Printing Pen that is adjustable, with high-resistance capabilities. The LCD screen provides users with the ability to monitor the melting point for better accuracy. It is compatible with both 1.75 millimeter ABS and PLA materials to offer more diverse 3D printing uses. The operation process is straightforward, making it suitable for young children and adults. The pen also comes with a stand that is equipped with a suction cup to prevent messes. Most 3D printing pens have a larger diameter than a magic marker. The main reason for this is because it contains various components that are necessary for functionality. However, it has a curvature center, where the area between the thumb and forefinger sits on the pen. This ensures a pain-free operation, even when using for an extended period of time. The LCD screen is conveniently located on the top panel, so you can monitor the speed and temperature, without needing to halt your work. The temperature setting can be adjusted from 160°to 180°Celsius for PLA and 180°to 210°Celsius for ABS material. The filament can easily be fed through the back of the pen, which is also where the charging plug is located. Everything is neatly situated, so the user has easy access to every feature for added convenience. 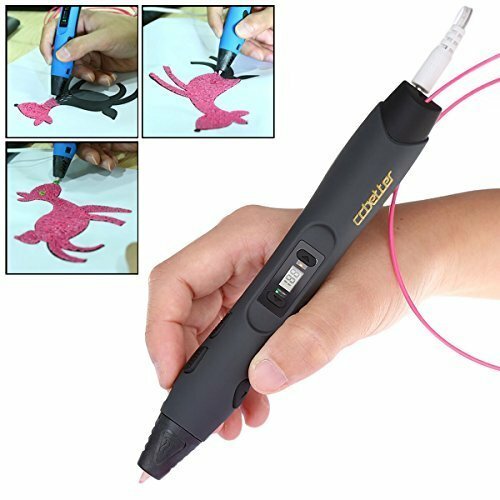 The CCBETTER Intelligent 3D Printing Pen is one of the best on the market. It is designed to provide anyone looking to utilize his or her creative side many hours of excitement. The pen’s ergonomic design is perfect for big hands, but children will not find the overall feel distracting in the least. The pen might be a little costlier than the alternatives, but it is well worth the additional cost. It is comfortable to use, easy to adjust, and will most certainly withstand the test of time. All in all, it is a good investment for any artist. Before getting into the complexities of 3D pens, it is essential to take the time to learn about the basics. Although this type of pen works very similar to a traditional pen, it is also unique. 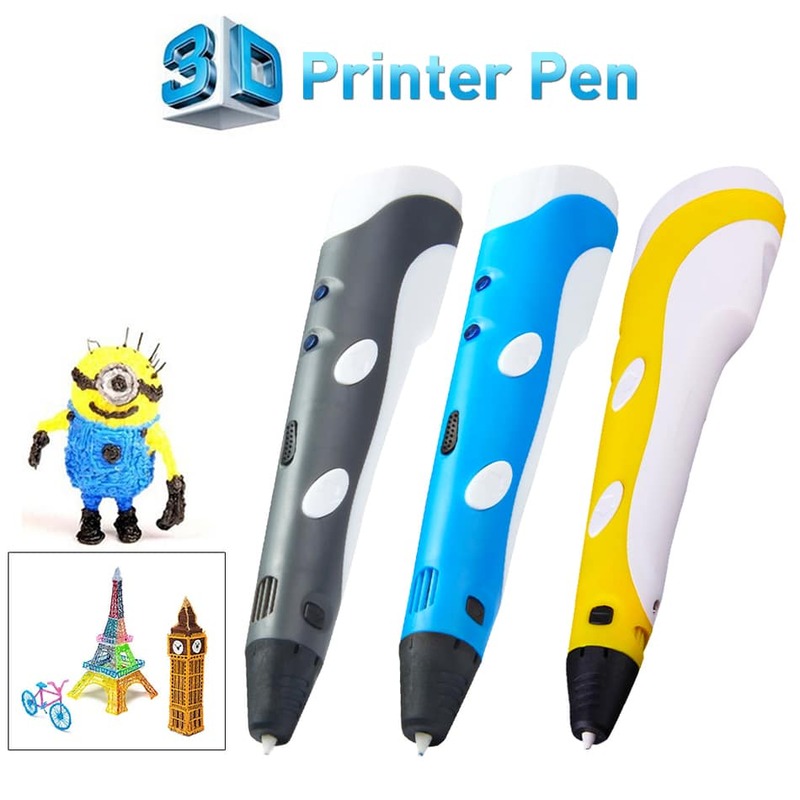 A 3D pen will look very similar to the vibrating pen, which you should be familiar with from your childhood. The pen will be bulkier and heavier than the traditional models and it works in a unique manner. Instead of using traditional ink, these innovative utensils utilize plastic. Plastic is inserted into one end of the pen and it is ejected from the tip, as you press it against the paper. How does it work exactly? This is a good question. In order to get a better insight into the 3D pen, you should think about the old days and the traditional glue gun. Almost everyone has used a glue gun at some point or another. A stick of glue is added to one end of the gun and it is heated, before being ejected from the gun. The glue will come out of the gun hot and stick, which makes it effective for sticking materials together. The 3D pen is very similar, but it utilizes plastic and serves an entirely different purpose. Colored strands of plastic can be added to the pen. The strand will be heated inside of the pen. Once you put the pen to paper, the gooey residue will eject from the pen’s tip and stick to the surface. At this point, you may be a little taken aback by the concept, but these pens are truly simplistic, especially for the user. The pen’s plastic refills are often referred to as filament. They’re available in various colors, including white, black, blue, pink, and so much more. And, it is even possible to find glow in the dark colors. Unlike traditional pens and their ink, the plastic filament can be utilized on almost any surface. Once the filament is added to the pen, it will be heated. This will change its consistency and make it a little bit sticky like glue. Thanks to its stickiness, the plastic can be applied to a wide variety of different surfaces, including metal, paper, plastic, and more. And, it is even possible to draw in the air with such a pen. When attempting to purchase refills for your pen, you will find that most filament is sold in terms of length. The plastic will arrive in a long strand, so you can cut off a piece and add it to your pen. The plastic isn’t as important as the pen itself, so it is truly possible to purchase almost any refill, as long as it matches the size requirements of your pen. Just remember that the filament is available in ABS and PLA plastic. When you take the opportunity to look at a 3D pen, you’ll likely be startled by what you see. This is a natural reaction. The pen is big, bulky, and it may include a power cord. How in the world is that going to work? How could anyone use such a bulky pen? These are common reactions, but you’ll quickly learn that using a 3D pen couldn’t be easier. Once the pen has arrived at your door, you’ll want to open the box and plug in the power cord. This will trigger the pen’s internal heating mechanism. Give it a few seconds to heat up and grab the filament. The filament is generally inserted into the back or top of the pen. The pen will feature arrows or controls on its exterior. These control the speed at which the filament will be extruded from the tip. Adjust the speed as desired and touch the tip to the surface where you want to apply the plastic. The plastic will flow from the pen’s tip, until you stop it manually. When it comes down to it, each 3D pen will work different from one another. In order to figure out the specifics for your pen, you’ll need to read the included instruction manual. However, most pens will require you to press both buttons simultaneously to eject the filament. Once the plastic has been ejected, you should be able to remove it fully. Insert the desire color and begin drawing immediately. In some cases, it may take a few seconds for the colors to switch. This is natural and is caused by left over filament within the pen’s tip. What Can Be Accomplished with A 3D Pen? It is truly possible to create a wide variety of different works with this type of utensil. These devices are primarily marketed to artists, but they can also be used to repair decorations and ornaments around your home. It is also possible to use a 3D pen in conjunction with a 3D printer to create bigger masterpieces very quickly. Below, you’ll discover some of the potential decorative items, which can be created with a 3D pen. When taking the time to look at 3D pens, you’ll likely form the opinion that they would be difficult to maintain. This couldn’t be further from the truth. In most cases, these pens require very little, if any, maintenance. However, there may come a time when you’ll need to clean the tip. If the filament has become clogged within the tip, it may not be able to push through to the other side. When this happens, you’ll need to remove the remnants and unclog the pen, so it can begin working once again. To begin, you should unplug the pen and allow it to cool down. Do not force anything into the pen’s tip, as this could cause the item to break or become damaged. Instead, use a cloth and a little rubbing alcohol to clean the tip. Also, be sure to change the nozzle as recommended. The nozzle should always be changed when the pen is hot. If you’re ready to take the plunge and want to experiment with this artistic instrument for yourself, you’ll want to make sure you invest in the best pen you can possibly find. The prices of such pens can vary substantially. If you’re not careful, you may very well end up with a dud. So, how do you know for sure which pen is the best? This is truly a difficult answer to question and one that you must figure out on your own. With this in mind, you should consider the factors below, when attempting to find the best pen for your money. Most consumers will focus very closely on the price, while putting less emphasis into other factors. This will prove to be a mistake. Price can be subjective and may not help you make the right decision in the end. Some of the best pens are the cheapest and vice versa. You never really know, until you try the pen for yourself. Therefore, ignore the price tag, until you’ve consider the other factors below. When looking for a pen, you should consider how much freedom you desire. Would you like to be able to use the pen anywhere and everywhere? Remember that most 3D pens are currently corded and will need to be plugged into an electrical outlet. This can be very problematic for those that want to create beautiful works of art in the great outdoors. Thankfully, there are a few cordless 3D pens and they work just as well. Just remember though that the cordless setup will require the use of batteries. Whether the batteries are rechargeable or replaceable, they may become a nuisance and expensive over time. It is definitely true that you’ll want to be able to utilize your pen for lengthy duration, without any pain or discomfort. In order for this to be possible, the pen will need to be ergonomic and comfort to use. Be sure to pay close attention to the overall design of the pen to ensure it will be comfortable. Colors and other aesthetics may be important to you. In order for these pens to heat up the filament, they need to use an internal heating mechanism. Unfortunately, some of these pens can be very loud. If you want to make beautiful, 3D masterpieces without disturbing anyone, you’ll want to make sure your pen will remain silent. This isn’t something that manufacturers will boast about openly, so you’ll need to look carefully and ask questions, before making your purchase. Traditional pens are usable without any additional ink. This is simply not the case with 3D pens. You’ll need filament and plenty of it. You’ll want several rolls of filament and various different colors. Before making your purchase, be sure to inspect the package’s contents. What exactly is included? If you’re able to get a big bundle of filament upfront, you won’t have to purchase so much in the future and this will save you money. Also, consider whether or not the pen comes with a case or any maintenance tools. These will help keep your pen safe and well maintained. Each pen should be customizable to some degree. Their operation is also configurable in terms of speed. The pen should feature at least two buttons. One will increase the ejection speed, while the other one will decrease it. The buttons should be very durable and they should be easily accessible at all times. Finally, you should look and see whether or not the pen’s manufacturer offers a warranty. This might not impact the pen’s performance in the short term, but it could very well protect your investment in the long run. A lengthier warranty is always best and will help to protect your pen for a longer duration.